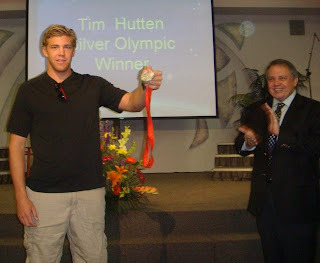 Olympic silver medalist Tim Hutten was honored at his home church, Grace Community Church of Seal Beach, Calif. (Don Shoemaker, pastor), on Sunday, September 14. Tim was part of the U.S. Men’s Water Polo team at the Bejing Olympics. Sometimes a watchful eye could see his mother, Cindy Hutton-Eagle, cheering for the team from the stands. Tim has since traveled to Greece to pursue a professional water polo career. He hopes to be part of the 2012 London Olympics and will continue to train for it. For more information, see blog posts of August 20 and 25, 2008. In the photo at right, Tim shows his medal while Pastor Don Shoemaker looks on.